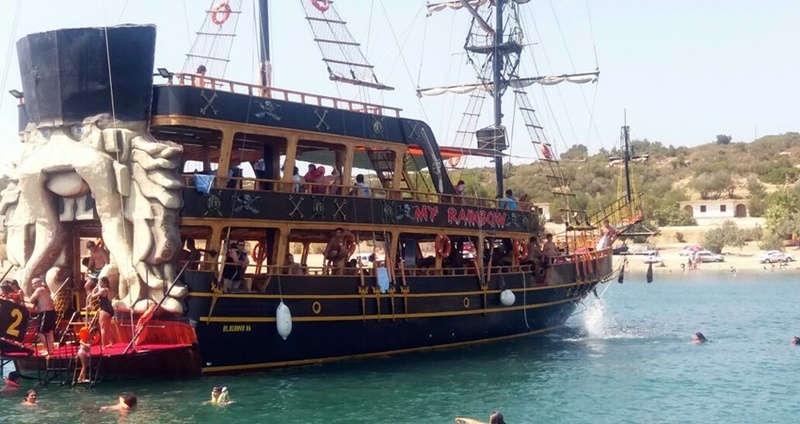 If you would like to have a quite unusual vacation experience and see some of the most beautiful bays and coves of Mediterranean while having the time of your life, then our splendid Turunc Pirate Boat Trip is just what you need. Turunc Pirate Boat Trip starts with transportation from your lodging in Turunc. 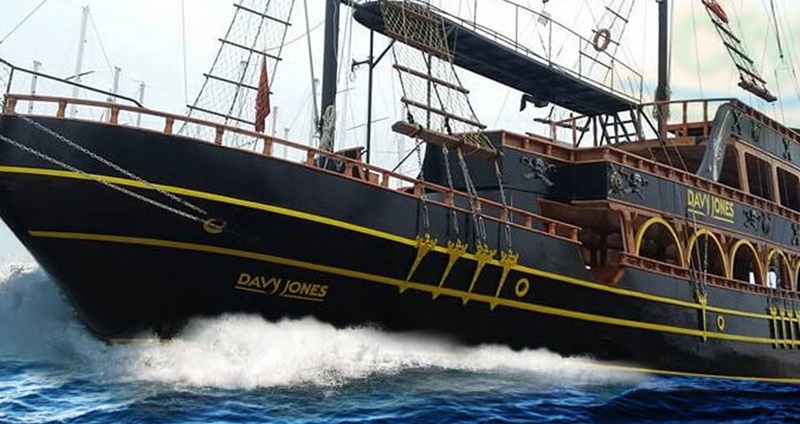 Our driver will take you for a ride to the port where our delightful Pirate Boat will be waiting. You will be greeted by our hospitable staff. They will help you board the boat end prepare for the upcoming adventure. We will visit many gorgeous places along the Turkish coastline, so you will get to enjoy a marvelous view while you are having fun on our entertaining boat. The staff of our awesome boat has prepared an array of fun activities for children and adults, so no one gets bored while traveling with us. We also employ the services of a phenomenal animation team, and our inventive animators will keep you and those around you entertained at all times. During the tour we will throw a foam party, so make sure to take some extra close and your sense of adventure with you. 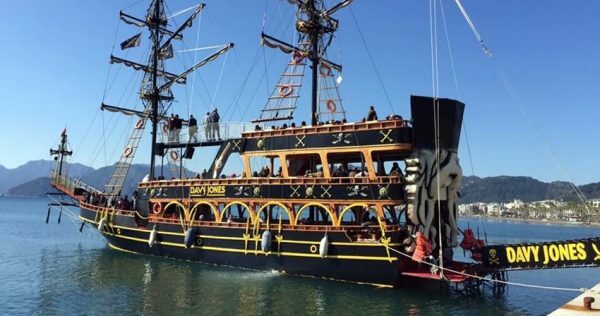 Turunc Pirate Boat Trip also features an open buffet, offering barbecue lunch including fish, chicken, pasta, as well as a variety of fruits. Drinks that are included in the price are Fanta, Sprite, Cola, as well as a choice of alcoholic ones, Wine, Vodka and Beer. The price also includes beverages such as Coffee, Tea and Water. You can pick whatever you like from the offered assortment and party under your own terms. During Turunc Pirate Boat Trip, we will take several splendid swim breaks, so you will get to visit some marvelous secluded bays. The first bay we will stop at is the wonderful Bakla Buku, where you’ll get to take a dip in its clear-blue waters and swim to its sunny beach. This bay is especially dear to most of or guests as we also organize an entertaining treasure hunt on its lovely beach. We will also visit several charming remote villages, so you will also be able to purchase some souvenirs and colorful exotic spices. 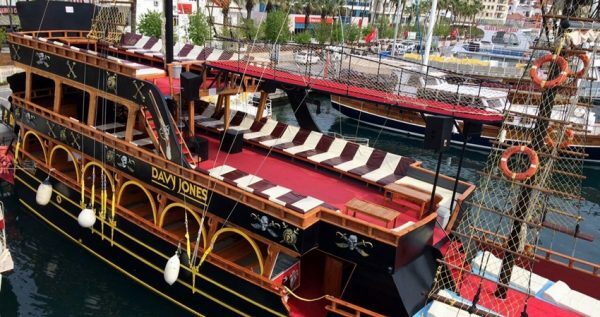 This fun tour is a guaranteed delight for our guests, so don’t overthink it, book your spot on our party-boat now! If you like boat trips Turunc Dalyan Tour is another great day out. 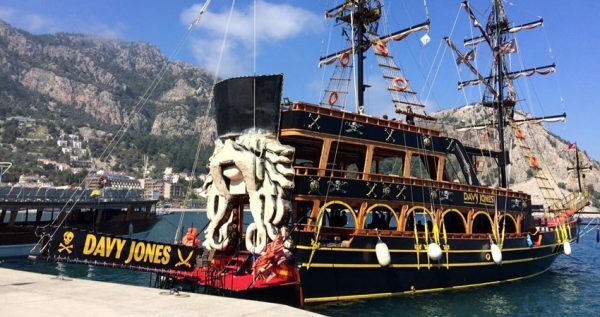 Our driver will pick you up in front of your respective accommodations from 08.30 in morning for Turunc Pirate Boat Trip. 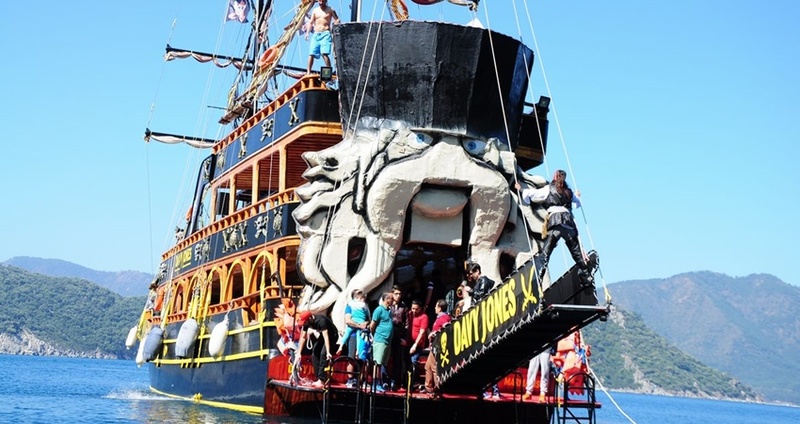 You will have a cozy ride to Marmaris harbor where our stunning Pirate Boat will be waiting at anchor. You will be warmly welcomed by our staff members, who will help you on board. We will take several wonderful stoppages at some wonderful bays with transparent turquoise waters and soft sandy beaches. 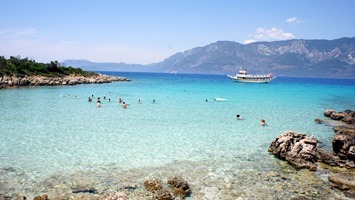 You will get to swim, and frolic on some of the prettiest beaches of the Turkish coastline. Bakla Buku bay will be our fist stop. There you will get to jump off the boat and swim to the sunny shore of Bakla Buku. We have prepared a marvelously fun treasure hunt for everyone who decided to take this tour with us. Once you reach the sure, the adventure can begin! Our boat’s staff members also include experienced animation team, so you can be sure that you and all members of your group will have fun at all times. 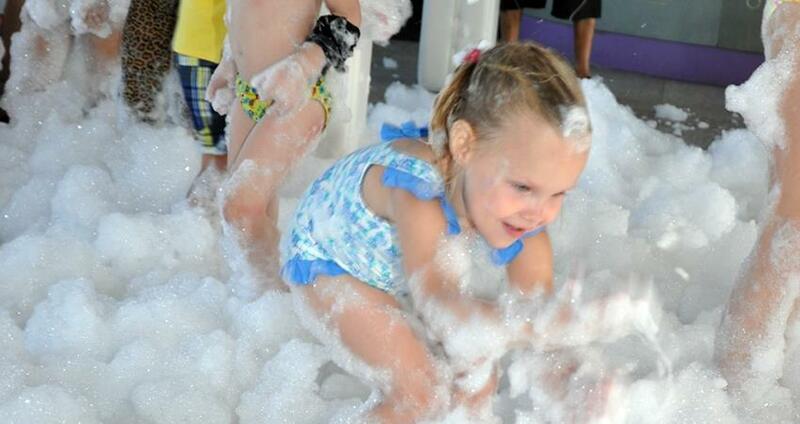 Amusing activities are prepared for participants of all ages, so both children and adults will be fully entertained. 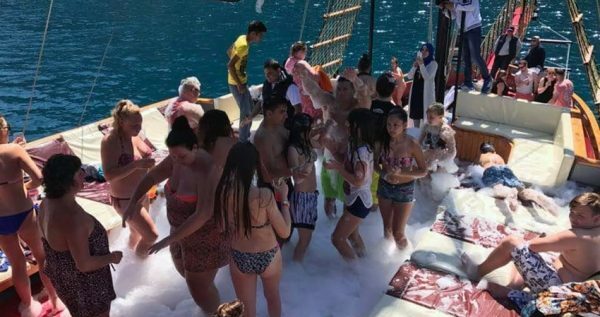 During our marvelous tour we will also have a foam party, which is a fun and unforgettable experience for everyone involved. 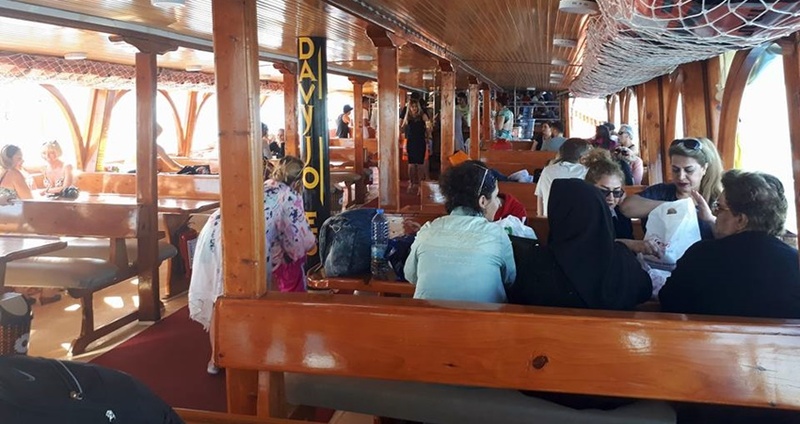 Our boat also features an open buffet lunch which usually consists of BBQ chicken and fish, as well as rice, fruits and pasta. Drink included in the primary tour price include nonalcoholic, Sprite, Cola and Fanta, as well as alcoholic Wine, Beer and Vodka. We are expected to reach the marina at approximately 4pm. You can take a bus back to Turunc afterwards. Turunc Pirate Boat Trip includes amenities such as hotel transportation from Turunc to Marmaris Harbour, full insurance package, English-speaking Pirate Boat crew, BBQ lunch, selection of both alcoholic and nonalcoholic drinks. This fun boat-ride doesn’t include any restrictions, the tour is completely safe for all age groups.